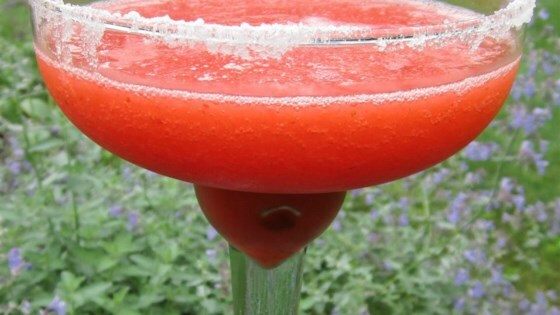 "A refreshing variation on a classic frozen margarita." Blend strawberries, tequila, lime juice, triple sec, and 1 teaspoon sugar in blender to combine, about 10 seconds. Add ice cubes; blend on high until the ice is crushed, about 15 seconds. Rub lime wedge around the rim of a glass. Spread 1 teaspoon sugar onto a plate. Dip glass rim in sugar to coat. Pour margarita into the glass. This is an enjoyable strawberry margarita. Next time I would cut back a smidgeon on the lime juice. One of the best recipes I've tried so far! Good mix of flavors. No ice - just used frozen individual strawberries I had frozen. Added a bit of simple syrup to sweeten them up. Yummy! I would add less lime and double the amount of ice. I multiplied everything by 4 (minus the lime; x8 for the ice) and it came out perfect! Definitely using this recipe again and again!! This is a really nice margarita recipe. It is so much better with lime juice and not frozen limeade. I'll be making these all summer long! !